Customer experience has become a top priority for companies in 2019. Today’s consumers base their perception of a brand on the meaningful moments they have with it. Importantly, those moments don’t just happen at the checkout page, or on the service line. Social media has emerged as a crucial touchpoint in building customer relationships. According to Gartner, churn increases by up to 15% for businesses that fail to respond to messages on social media. Used correctly, your social channels are more than just a way to respond to complaints. They’re how you build lasting connections and brand loyalty. Brands have only just begun to unlock the full power of social. Channels like Instagram, Facebook and Twitter aren’t just for promotion. They can also be a way to connect with your customers. 91% of people believe in social’s power to connect communities. 78% of consumers want brands to help people connect through social. 76% of respondents were more likely to buy from a brand they felt connected to on social media than a competitor. What’s more, our research found that building customer relationships on social media helped brands to improve their bottom line. When consumers felt connected to brands, more than half increased their spending with that company. So, how do you start developing these rich relationships? Building customer relationships is all about delivering value to your followers. If you can provide helpful, informative or even entertaining content, people will want to connect with you. Unfortunately, there are still many brands out there that take the “what’s in it for me” approach to social. If you’re ready to flip the script, start by listening to your audience. 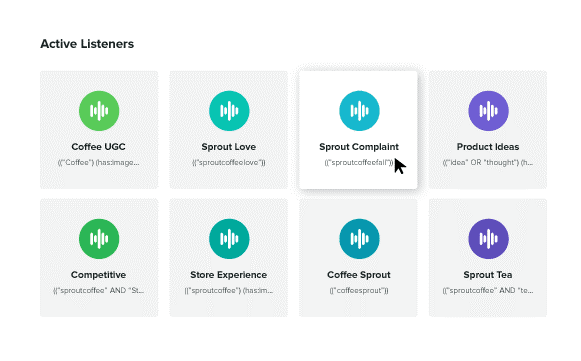 Sprout’s social listening tools will give you an overview of what your audience is talking about online. From there, you can collect keywords, ideas, and inspiration to generate meaningful material on social. The more you create content that responds to your audience, the more you show them that you value their thoughts and feelings. 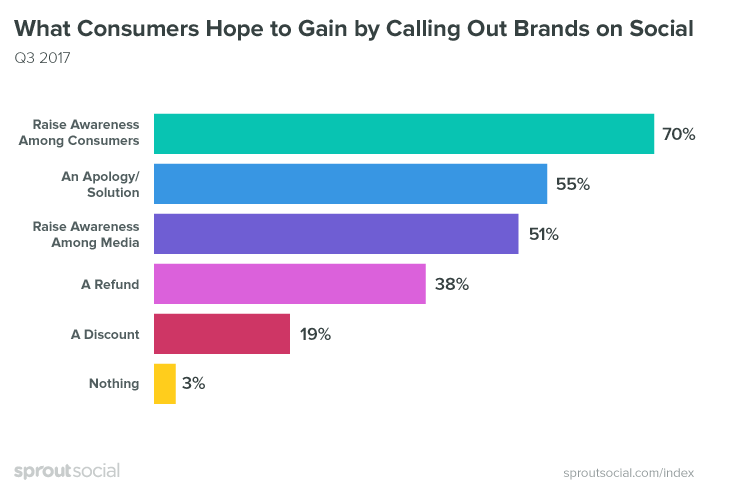 According to our study into call-out culture, 55% of people who call out brands on social just want to be heard. Make sure you’re listening. Listening is just the first piece of the puzzle. You also need to respond to what you hear. According to The Social Habit, 32% of customers expect a response within 30 minutes online. Fail to address their concerns fast enough, and you could see your customers’ anger spread across social media. Fortunately, there are tools to help you catch every message as they come in. 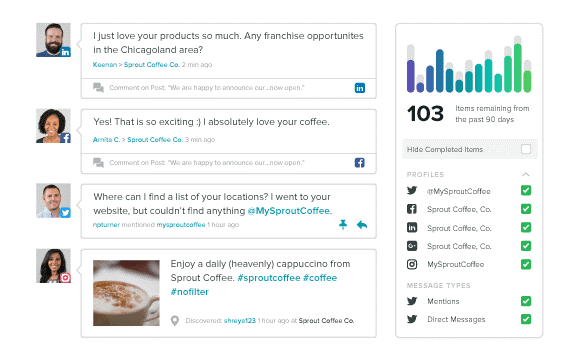 Sprout Social’s Smart Inbox will help you to track what customers are saying and respond with speed. Speeding up your response time does more than just delight your customer – it can also improve your revenue. A report by Twitter found that airlines responding to Tweets in 6 minutes or less earned customers willing to pay $20 more per fare. Quick responses provide not only the speed and convenience that people crave, but also build your brand as one customers can trust and rely on when there’s an issue. These are benefits that customers are willing to pay for. Importantly, while responding quickly is essential, a standard automated message may not be enough. 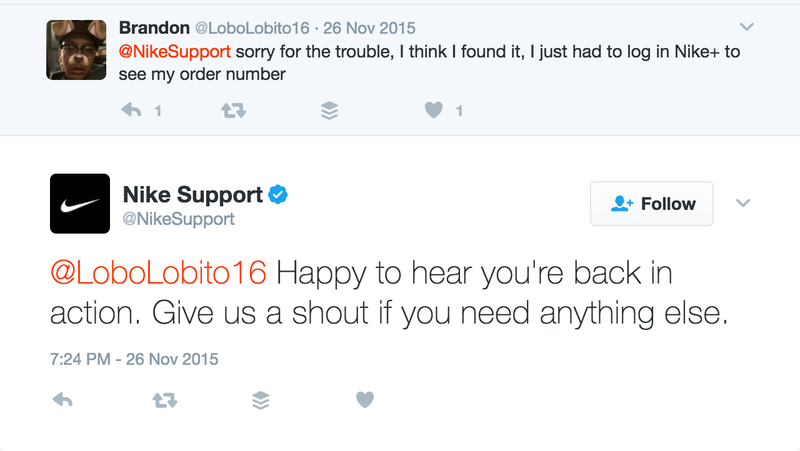 Bots can help show your customer that you care about their problem, but only if you can follow up with human correspondence soon after. Social media is an intimate way to connect with your customers. It’s where your followers also interact with friends and family members. People expect their discussions with brands to be just as comfortable as a message to a friend. Be friendly – let your customers know that you’re there for them. After the conversation, make sure you let your customer know you’re not going anywhere. Leave them feeling happy that they talked with you. Look at this example from Nike, for instance, where the customer found the resolution themselves, but the brand stayed engaged and showed that they’re available regardless. Don’t reserve your unique personality for when you’re talking one-on-one with customers. Social media is a place where people can showcase their style and tone of voice. Since human beings connect with other humans, not just faceless corporations, it’s important to give your company a heart. Introduce people to your staff with photos, bios, names, and stories. Adopt a fun and friendly tone in your messages, complete with emoji if it fits your brand. Take part in trends and discussions that your customers are interested in. Another great way to show your human side is through video. Video is a direct insight into your team, and people. With streaming features like Facebook Live and Instagram Live, you can even deliver an unfiltered view of your company. This is an excellent opportunity to demonstrate your transparency as a brand. Try using video for Q&A sessions with team members, behind the scenes snapshots and more. While building customer relationships shouldn’t mean constantly bribing your followers, it’s worth showing them how much you appreciate them. Remember, they’re choosing you over all the other brands out there. That deserves a little love. Another way to show your appreciation of your customers is through a client of the month post or regular case studies. This type of content helps emphasize your customers’ achievements while also demonstrating how your product contributed. With a little luck, listening to customers on social will generate more positive comments than negative ones. However, there’s always a chance that you’ll come across someone that’s unhappy with your business. Rather than trying to sweep these negative issues under the rug, appreciate them for what they are. They’re great for building customer relationships on social media. Our previous study into call-out culture shows that 70% of customers go to social media to raise awareness of an issue. Your audiences want you to know what’s going wrong with your company, products or servies so that you can fix it. Respond quickly to these pain points that your customers have, and you could transform even the most unhappy customers into brand advocates. All it takes is one great experience to remind your consumers of what they love about your brand. Just remember to use the right tools to monitor mentions of your brand even from users who aren’t directly tagging or @mentioning you. Have you ever received a surprise gift from a friend or loved one? Maybe your spouse brought you some flowers after a tough day at work. These little gestures make a world of difference to our relationships. It’s the same with businesses. When you’re building connections on social media, always look for ways to go the extra mile. Treat your followers on your most active social platform, by giving them access to exclusive discounts, promotions or events. Everyone loves a deal, and they’ll appreciate it even more if they feel like it’s an exclusive. Remember, going above and beyond for your customers takes more effort in the short-term. However, in the long-term, you’ll benefit from happier customers and a stronger brand. A PWC study shows that companies offering great experiences have a 16% premium on services and products. Finally, when it comes to building customer relationships, there are few things more important than respect. If you want your consumers to be loyal to you, then you need them to see that you value their opinion. Perhaps the easiest way to do this is with user-generated content (UGC). User-generated content tells your followers that you take their views and ideas into account when building your brand. It’s also a great way to build your social proof and generate sales. According to Photoslurp, user-generated photos are 5 times more likely to convert customers. Starbucks is an excellent example of a brand that frequently re-shares and regrams content from followers. Perhaps the best way to use UGC is to ask your customers for ideas on what your business should do next. This simultaneously delivers inspiration for your team and gives you an insight into what people want from your company. What’s more, when you bring your followers’ ideas to life, they’ll feel more invested in them, because they played a part. Just remember that if you do repost any content or use any ideas, you’ll need to give credit where it’s due. According to Wunderman, 79% of customers say that they want brands to show that they “understand and care” about them before they buy anything. Social media is the perfect place to start building connections with your customers. It’s an environment that’s naturally intimate, where we celebrate the need to share. How do you use social media to forge connections with your customers? Let us know in the comments!